Ramen Yamadaya is a chain of ramen restaurants that stretches along the California coast from San Francisco to San Diego. I tried the location in Costa Mesa and ordered the Tonkutsu Kotteri Ramen which comes with a slick of really tasty black garlic oil floating on top of the thick, fatty pork broth. The Tonkutso pork bone soup is cooked for 20 hours, 10 hours at a high boil to break the bones into flakes, and then simmered for 10 hours to extract the flavors. The service at Yamadaya is idiosyncratic, with our three entrees brought to us over a 15 minute window and before the appetizer dumplings arrived. The Dumplings: the Ramen Yamadaya menu lists Takoyaki, Vegetable Gyoza, Pork Gyoza, and Spicy Gyoza. They also serve Taiyaki which are fish shaped deserts made of a cooked, waffle like batter stuffed with red bean paste. One of my lunch companions pointed out to me that using Dumpling Hunter’s definition of a dumplings, Taiyaki should be considered a type of desert dumpling. We ordered the Veggie Gyoza, which are vegan, but were denied because they were out of them that day. Instead, we tried the inspired Spicy Gyoza which have thin, delicate wrappers and are filled with pork and minced kimchi. These house made dumplings were juicy and had a serious kick that was too much for one of my friends. The bottoms of the dumplings were fried crispy and golden and then the dumplings were covered so the tops of the dumplings steam cooked. My one complaint is that the dumplings were a little greasy. The Dipping Sauce: Ramen Yamadaya serves a well balanced soy and rice vinegar dipping sauce, that I imagine would be great with the veggie or pork gyozas. But the sauce was wasted on the Spicy Gyoza, the minced kimchi provided a built in spicy sauce that was all I needed with these dumplings. The Location: We hit the location in Costa Mesa in Orange County, south of LA. This location is located in a nondescript strip mall type plaza and the intersection of Baker Street and Fairview Road, the exact address is 1175 Baker St. Costa Mesa, 92626. 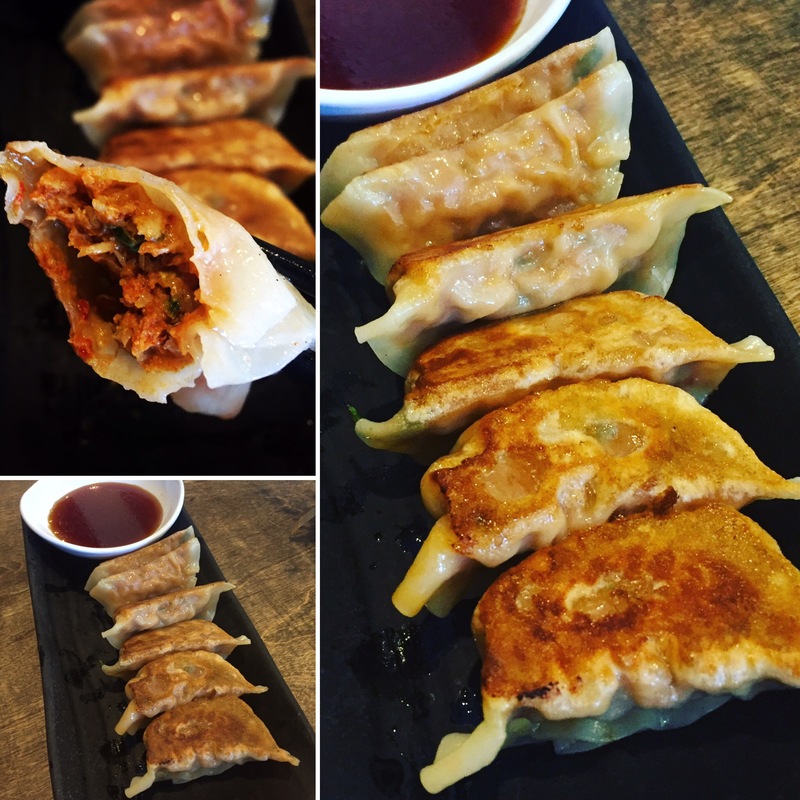 This entry was posted in Gyoza, Japanese, Kimchi, Los Angeles, Pork, Potsticker, Vegan, Vegetarian. Bookmark the permalink.